I have been looking at this screen for the last 2 days. There are lots of things that I want to tell you but I do not know how to start. First things first, thank you so much. I received the package of goodness. You know me too well. JJ said you called. Thanks again. I miss you everyday. I tick off the calendar days – they are edging closer. It has not been easy these past months. I have learnt to choose happiness over all else. It is tougher to wear a smile when you heart is bleeding. Story of my life. I have been reading too. Last weekend, I got myself a month’s worth of reading material at no cost. God still prevails! October begins tomorrow. 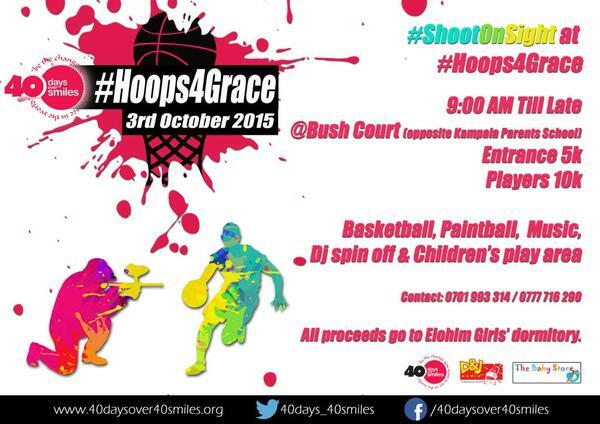 Like it has been done for the past 2 years, my friends of the 40 Days over 40 Smiles Foundation are having the annual fundraiser – Hoops 4 Grace. As usual, the event will take place at Bush Court (Naguru) opposite Kampala Parents School. Entrance is only 5,000 Ugx. It is for a good cause – A dormitory for the girls at Elohim. Go show them some love! It will take place this Saturday! On the same day, people throughout the world will march as one for one common purpose: to educate and spread awareness about the poaching crisis and illegal wildlife trade in ivory and rhino horn that is plaguing our world RIGHT NOW. 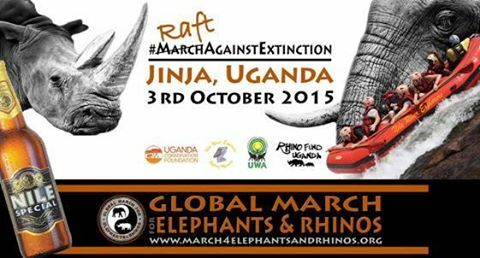 In Uganda however, we will not be marching. We will be rafting the Mighty Nile instead! Over the era of Idi Amin and the civil wars that followed, severe poaching across Uganda resulted in the violent demise of Northern white rhinos and elephants in Uganda. Uganda went from having more mega-herbivores per square kilometer than anywhere else in Africa – with famed herds of thousands of elephants – to seeing rhinos become extinct and elephants dropping to their lowest ever population of just a few hundred. In recent years the poaching of elephants and rhinos in Africa has reached unprecedented heights as the demand for ivory and rhino horn has soared in China and other mainly Asian markets. Whilst poaching is of concern in Uganda, the efforts of the UWA and partner conservation organisations have succeeded in sustaining a slow but steady growth in its elephant population. Uganda’s elephant numbers have increased by 600% since their lowest point in the mid-1990s, and we are the only country in Africa who can claim zero poaching of rhino since their reintroduction in 2006. Whatever event you choose, you will be doing for a good cause! Stand up and represent, your country needs you! Patience, I must go now. Always know that my love for you is limitless. This entry was posted in Uncategorized and tagged 40 days over 40 Smiles, Amin, charity, elephants, Elohim, Hoops4Grace, Jinja, October, Raft Africa, rhinos, Uganda by Sibo. Bookmark the permalink.